The first gallery in the sculpture section is dedicated to the ancient world. On show are Iberian votive offerings, terracotta earthenware, bronze objects and oil lamps from the Punic, ancient Greek and Roman eras. 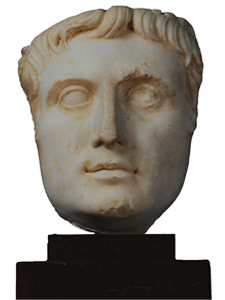 There are also various sculptures and portraits like the one dedicated to Octavian Caesar Augustus. Octavian was nephew and adopted son of Julius Caesar, and was elected the first emperor of Rome by the Senate in the year 44 BC. His work as a statesman was notable and his long reign made it possible for significant progress to take place throughout the empire. He managed to bring an end to civil war and to pacify the vast Roman territories. He reformed the army, founded new cities, created new infrastructures and transport routes and endorsed a strong and powerful legal system. Following his death, he was raised to the "divi" category, meaning he was deified. This accounts for the great number of temples and portraits that were crafted in his name, all of which were subject to official stylistic guidelines. This portrait (one of the few that has remained in Spain) comes from Tarragona, the capital city of Hispania Citerior in Roman times. It was probably sculpted in Rome in the first third of the first century AD during the reign of Tiberius, who succeeded Augustus. Made of white marble, this is a Prima Porta portrait, so-named for the spot where one of the best examples of its kind was discovered. The emperor's gestures are relaxed, his large eyes direct one's gaze to the right, and his mouth is boldly outlined. His straight hair features well-defined locks across the brow, opening out from the center toward the temples. This sort of portrait captured the very image of the enduring power of the empire; in fact, there are several official portraits of Napoleon in which traces of this style can be noted.